Rami Malek won Best Actor at the 2019 Oscars for his role as Freddie Mercury in Queen. This is Malek’s first Oscars win and first nomination. The other nominees in the category were Christian Bale for Vice, Bradley Cooper for A Star Is Born, Willem Dafoe for At Eternity’s Gate, and Viggo Mortensen for Green Book. Bohemian Rhapsody also won in Sound Mixing, Sound Editing, and Film Editing categories earlier in the night. Christian Bale and Rami Malek were favorites for the category, given their roles’ distinctiveness in their respective filmographies. Malek’s turn as Freddie Mercury was also Malek’s first major big-screen role. The 37-year-old actor was previously best known for his performance as reticent and neurotic hacker Elliot on USA’s Mr. Robot series. Malek previously won the Golden Globes for Best Actor and the Screen Actors Guild award for Best Actor in a Drama Film. Bradley Cooper’s portrayal of Jackson Maine was a potential favorite going into awards season, but A Star is Born did not do well at either the Golden Globes or Screen Actors Guild Awards, serving as a bad omen for its overall chances at the Oscars. 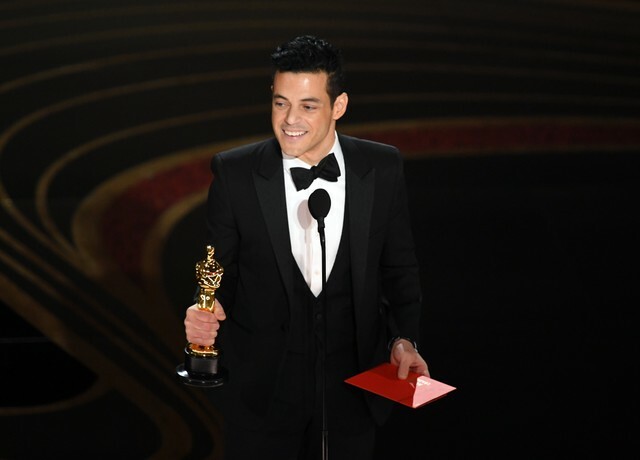 Watch a clip of Rami Malek’s acceptance speech below.